It’s almost Easter! Just a few more days until the Easter Bunny is due to deliver the goods. And when you’re six years old, this is a Very Big Deal indeed. Such a big deal in fact, that the six year old living at my place has been counting down the days since…well, December 25th came and went. 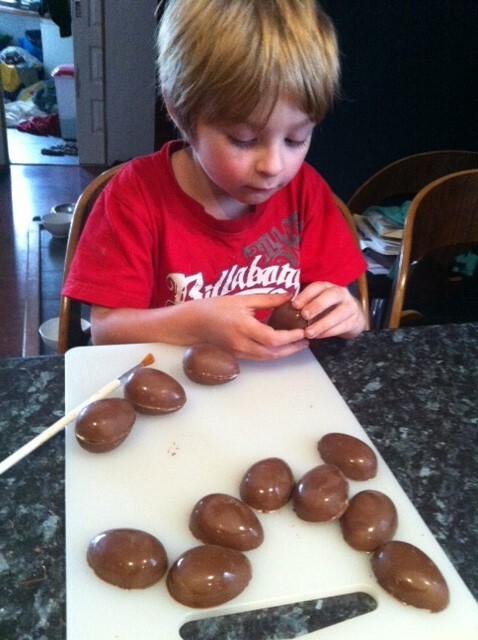 My kids are also currently on school holidays, so to help keep Mr 6 amused (and yeah, maybe to keep the Bunny-ache at bay…), we’ve been making all sorts of Easter Yummies. 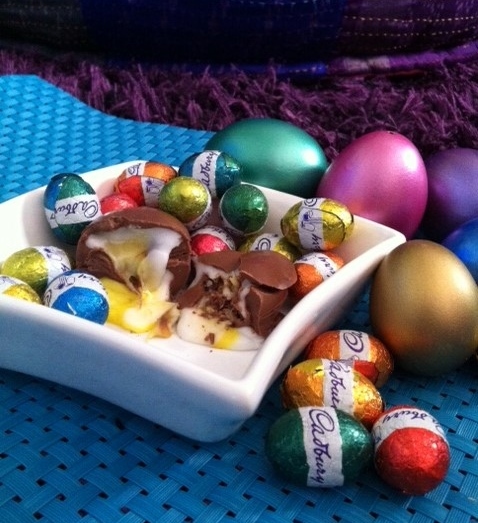 First up, the mandy wrangles version of that oh-so-amazing-gooey-chocolately-fondantey-goodness in a ball – the Cadbury Creme Egg. Egg shaped chocolate moulds. Mine are plain, but you could use patterned ones. White fondant, available from all cake decorating shops, some supermarkets and online. Brushing chocolate up the sides of the egg moulds. Using a spatula, spread melted chocolate as smoothly as possible across the back. Make sure your moulds are clean and completely dry. Remember: when working with chocolate, moisture is your enemy. Melt milk chocolate using your favourite method, whether it be a small amount at a time in the microwave, over the stovetop using the double boiler method, or like me, using a cheap little fondue set. Once your chocolate is melted, you need to work fairly quickly. Place a small teaspoon full into each chocolate shape. Now, you need these eggs to be hollow, so don’t over-fill. 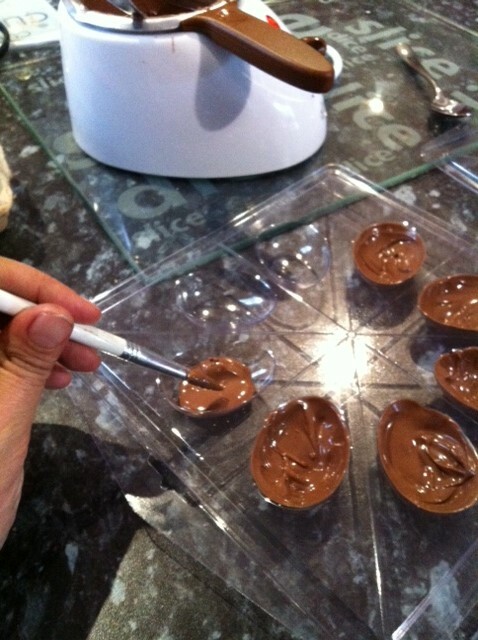 Using your paintbrush, brush the chocolate right up the sides of the mould before moving on to the next egg shape. 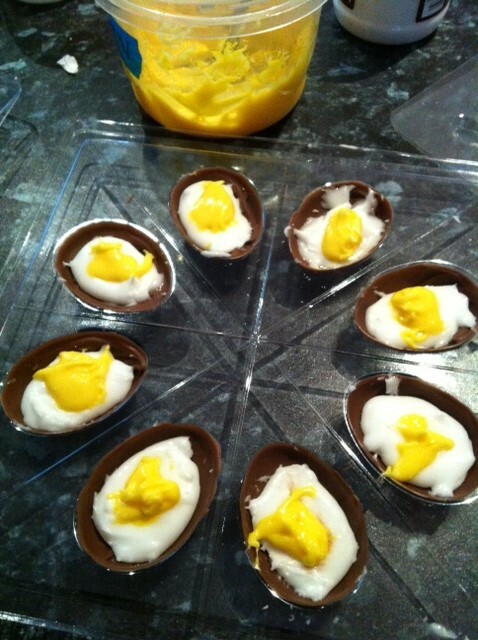 Once all egg shapes have been chocolatised (yes, that is totally a word. Now.) put aside to set at room temperature. Once your shells are set, spoon a teaspoon of white fondant into each. Then repeat with a smaller amount of yellow fondant in the centre. 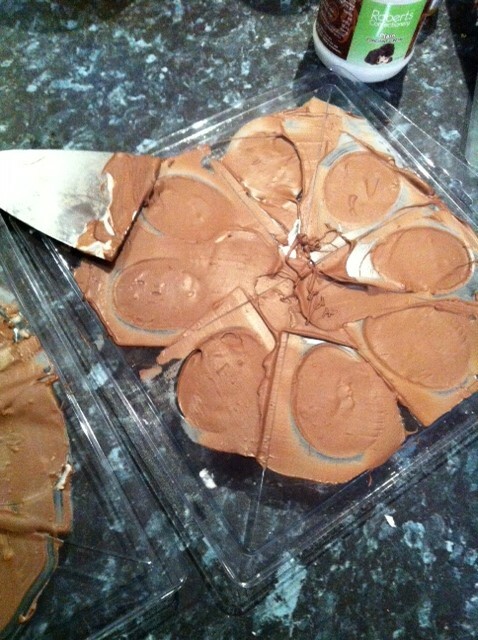 Melt up some more chocolate and smear over the top of your shells, trying not to make too much mess of your fondant. Smooth off the top with a flat knife or spatula, as in my pic. Once the egg halves are completely set (don’t rush them), they will pop out of the moulds with a small tap. Then, with a little more chocolate dabbed onto the back, join two halves together to make a whole. See…so easy a six year old could do it! See? So easy a six year old can do it.